The most chilling image is Reece modeling a women’s dance shawl. Dance shawls, particularly fancy dance shawls, are stitched with images—flowers, geometric patterns, button, shells and more—that resonate with tribal art. My mother sewed the Osage ribbon work for all our dance shawls—mine and my sisters’ and my daughters,’ with traditional patterns. 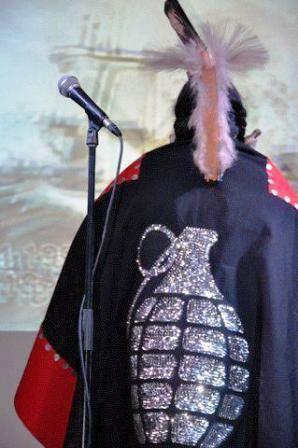 Reece’s shawl—actually a button blanket–is festooned with an image of a grenade. In her talk about art and ethics, Rickard said that indigenous people have long been silenced. Skeena Reece refuses to be silenced. This entry was posted in authenticity, framing and tagged stereotypes. Bookmark the permalink.